There were two main themes to Equinix’s strategy for dominating the global data center colocation market laid out during the Redwood City, California-based company’s recent Analyst Day presentation. On the technology side, a global software defined platform that simplifies enterprise cloud and SaaS. On the financial side, a balance sheet the company intends to use "as a strategic weapon," in CFO Keith Taylor’s words. Unlike most REITs, Equinix is not focused on a single real estate asset, working instead on building out a global platform. The company now has 7,000 employees supporting a portfolio of 200 data centers. Equinix has had an interconnection focus ever since the company was formed 20 years ago. In contrast, traditional REITs are primarily focused on spread investing (the difference between cost of capital and initial cash yields on acquisitions). Equinix has invested billions of dollars in technology to build a global network, consistently investing in upgrades and expansions. The latest evolution is the Equinix Cloud Exchange (ECX) Fabric, announced in December and launched this January. 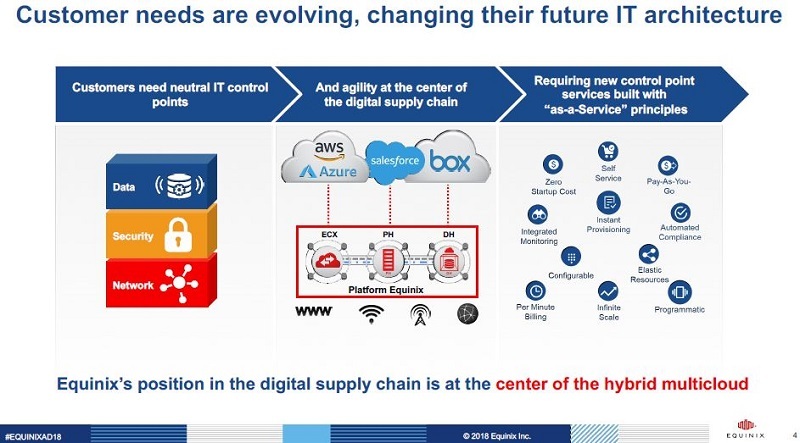 The next evolution will interconnect all three global regions and each of the 200 data centers, company executives said. 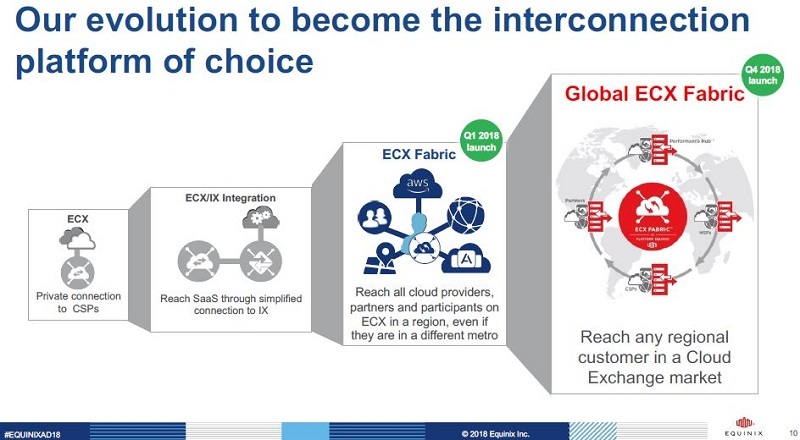 The Global ECX Fabric is SDN-enabled, allowing customers to self-provision new circuits in minutes. It’s also API-enabled, providing the ability to manage all connections from a single screen. The goal is for the network is to enable enterprises to migrate applications to public cloud and provision hybrid cloud deployments across the globe. Beyond the immediate potential win of accelerating enterprise bookings, connecting all three regions on a software-defined network has a big impact to the bottom line. Samuel Lee, the company’s president for Asia Pacific, said monthly recurring revenue, or MMR, per cabinet is 50 percent higher when multi-metro customers deploy in all three regions compared to single metro deployments. "Interconnection is the secret sauce," he said, "as well as consolidated billing for global deployments." The Cloud Exchange Fabric has both in-house and partner services layered on. So, in addition to being able to self-provision circuits and cross-connects, customers will have an "easy button" to select value-add services. Interconnecting multiple metros using the Cloud Exchange platform launched in 2014 has been a complex job for customers, Brian Lillie, Equinix’s chief product officer, said. Removing that complexity is critical to accelerating growth in the enterprise vertical. He expects SaaS-like point-and-click provisioning across the entire IBX platform to become possible before the end of the year. During the 20-year history of Equinix the company has grown both organically and through M&A. The company is currently integrating eight acquisitions, most recent ones being Metronode in Australia and the Dallas Infomart. M&A deals tend to make great headlines, but Equinix also has well over $1 billion in organic expansions underway. 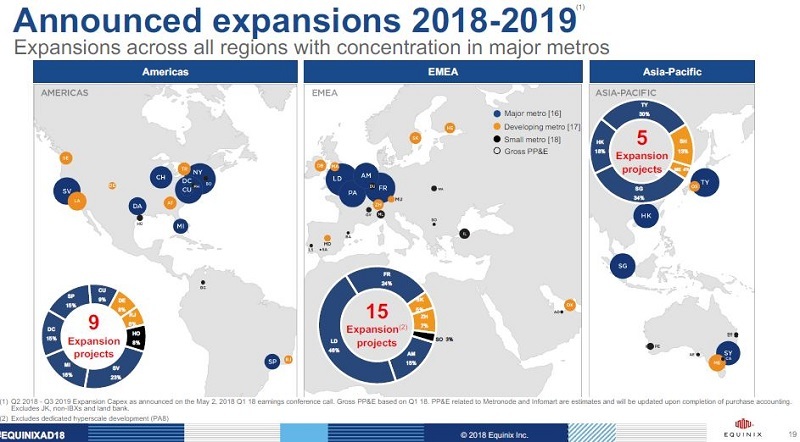 The largest number of project is in the EMEA region, and Taylor expects that over time EMEA and Asia Pacific will grow faster than the Americas. Equinix is focusing investment on building future phases in existing IBX data centers, owned assets, and developing owned land with 80 percent targeting major metro markets, both existing and emerging. Dublin and Shanghai, for example, are small markets today, but they will likely evolve into major markets over time, Taylor said. Transforming the platform is the best use of CAPEX, Taylor said. He highlighted three examples of transformational deals: the Telecity acquisition made Equinix number-one in EMEA; Switch & Data and Verizon deals expanded scale in the Americas; the Metronode deal made Equinix number-one in Australia; and Bit-isle transformed Equinix into the second-largest player in Japan. Key balance-sheet metrics are highlighted in the slide below. Taylor is hoping to reach an investment-grade rating during the next few years, but more strategic acquisitions could push it out farther. For the time being, the guidance is $10 billion to be spent through 2022. Equinix has invested a total of $25 billion in CAPEX over the past 19 years, so the current five-year plan is accelerating that growth. Taylor believes that "only Equinix can make the global investment at scale." He expects Equinix to become a $7 billion-dollar company by 2022 in terms of annual revenue. Taylor laid out an expectation of 8-10 percent revenue growth on average during the next five years. 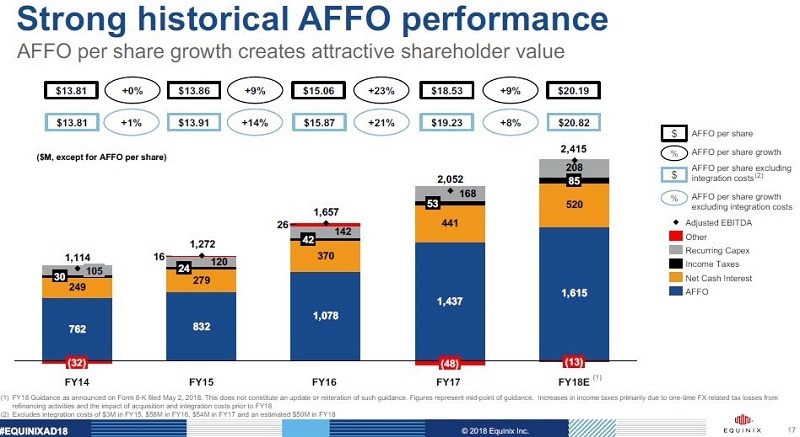 Additionally, shareholders should expect to see AFFO per share grow at 8-12 percent and a 2-3 percent dividend, for a total return of 10-15 percent each year. The small dividend yield is due to Equinix's low AFFO payout ratio: less than 50 percent and among the lowest of all REITs. The balance of free cash flow is invested into organic growth underwritten at 30 percent return at stabilized occupancy. 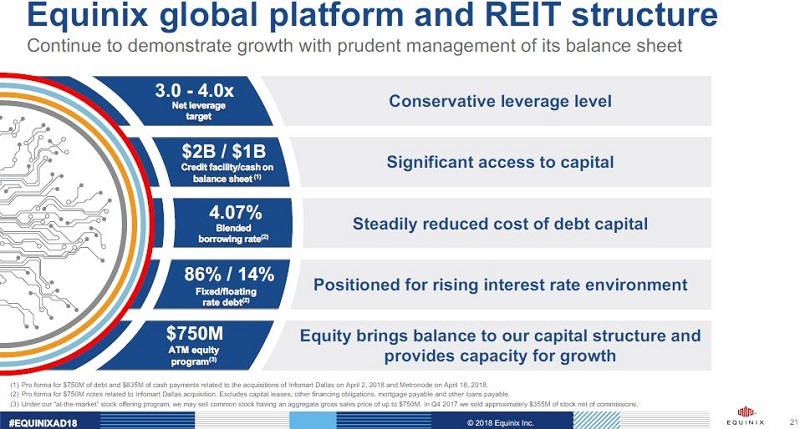 Those are strong numbers for a REIT. However, the chart below shows that it is a deceleration from the gaudy AFFO per share growth between 2016 and 2017. Taylor explained several times during his presentation that management is looking to grow the Equinix platform for the long term. Strategic and transformative acquisitions will continue to be a priority going forward. There was one more key area highlighted during the presentation: HIT, or Hyperscale Infrastructure Team. HIT’s revenue, EBITDA, and AFFO per share contributions are not included in current full-year 2018 guidance. We’ll focus on Equinix’s plans in the hyperscale market in the upcoming second part of this two-part series.